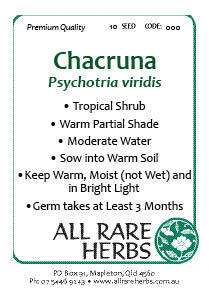 Chacruna, Psychotria viridis, is part of Yage, together with Ayahuasca, Banisteriopsis caapi. Native to the Amazon basin, Chacruna, is a tropical shrub, preferring warm, moist ground in part shade. This plant likes warm humid conditions and does not tolerate direct, hot sunlight. Germination: Seed does not require any treatment but benefits from soaking in warm water for 24-48 hours prior to sowing – change water regularly to keep warm and clean. Germination takes 3-6 months and during this time seed must be keep moist and warm. Growth is slow after gernmination, but once have achieved a height of about 50cm begin to grow more quickly. Be the first to review “Chacruna, seed” Click here to cancel reply.